"No concession should ever be made for the singing of the Exultet, in whole or in part, in the vernacular." I was talking to a friend of mine the other day who lives in California with his wife and kids. He was telling me about an experience he had a few weeks ago. It was a Friday night, and he was out with his family having dinner at a pizza shop. When the pizza came out, he went to lead his family in grace, so he made the Sign of the Cross. As they prayed grace together, he said he could hear people a few tables away laughing and mocking prayer as stupid. Similar situations are far from uncommon, and they are the very embodiment of these words from Wisdom 2: “The wicked say: Let us beset the just one”—let’s weigh him down, oppress him—“because he is obnoxious to us.” Can you identify yourself with “the just one”? Have you ever been mistreated or ignored—even persecuted—simply because you stood up for what you thought was right? That very thing happens all the time, and it’s not just in bad neighborhoods or third world countries or in California. There’s a loyal group of people in my parish who pray outside a nearby abortion clinic every Friday afternoon, and I can’t repeat many of the things that have been yelled at us there. If I were to take a walk through the mall near my church dressed as a priest, do you have any idea the reactions I would get? We, as people of faith in America, find ourselves being marginalized more and more, and perhaps we’re too complacent about it. For sure, it’s one of the beauties of the framework of our country that the government cannot establish a state religion. But the new “religion” of secularism has no more right to be established than any other faith. What began years ago as a movement to eliminate Nativity displays in public places at Christmas time has blossomed into campaigns against prayer in school. We are told now to believe that a person who helps another person to end his or her life can be called a “doctor” and that anyone’s love for anyone else can be called “marriage.” We are called “radical” for believing that the poor deserve special care, “crazy” for thinking that the prisoner should have rights, “extreme” for insisting that immigrants be respected. Most recently, as a result of the HHS Mandate that took effect in August, our own nation has said that our opinion as Catholics does not matter—that the Catholic conscience, which rejects, contraception is neither welcome nor respected. And, yet, it is we who stand for right over wrong and life over death who are called repulsive, intolerant, obnoxious. “The wicked say: Let us beset the just one because he is obnoxious to us.” And why is the just one so vile? The chapter continues, explaining that it’s because “he sets himself against our doings, reproaches us for transgressions of the law.” In other words, it’s because the just person stands up to the wicked. The just person calls right right and wrong wrong. The just person isn’t afraid to confront a person who acts without justice or kindness. That is what the wicked person finds so insufferable about the just one. There is good and there is evil, and we must distinguish between the two, both privately and publicly. Regardless of the reaction of the people around us, we must never be ashamed of our Catholic faith. Are we willing to be ostracized because someone think we’re “obnoxious”? 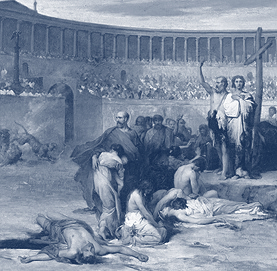 Jesus was crucified because He was found “obnoxious” in the court of public opinion. We should be willing not only to make the Sign of the Cross in public, but willing to allow our entire lives to be molded in the image of the Cross. Jesus assures us in the Beatitudes: “Blessed are you when they insult you and persecute you and utter every kind of evil against you falsely because of Me. Rejoice and be glad, for your reward will be great in heaven” (Matthew 5:12).